In the interest of keeping track (again) of where anything I commit to the web goes and what good it may be, I’m reposting my monthly messages to the Syracuse Astronomical Society (SAS) here. If, by chance, you find me first, are local (Syracuse), and have any interest in SAS activities, do drop a line. We’d love to see your featureless outline at our observatory this year. As a brief digression, one of my own research areas (molecular manufacturing) includes as part of its debate some number of scientists convinced of the impossibility, some number convinced of the inevitability (myself included), and a large majority that hasn’t thought hard enough about it to have an opinion either way. Unfortunately, there hasn’t been a single landmark demonstration to settle the debate. There are many direct comparisons to the work Prof. James Cordes will present as part of the MOST Space Science Series this Thursday. Is there life (other than what we find here on Earth) in the universe? Well, some are convinced yes, some no, many probably haven’t spent an entire cup of coffee trying to come to a logical conclusion, and there hasn’t been a single landmark demonstration either way. It is comforting to know that there are still VERY BIG questions in science we have yet to answer despite how confident many are in what we THINK we already know. All astronomy images have immediate aesthetic appeal. It’s a given. The degree to which these images convey deeper meaning and make the viewer stop and think about their place in the universe is another story. With all of the phenomenal Hubble images published in coffee table books, passed around on flash drives at Astro Club meetings, and cropped to perfect desktop background dimensions, there’s one specific pre-Hubble image that made the rounds as a real eye opener, if for no other reason than you had to be looking hard to see the fuss. 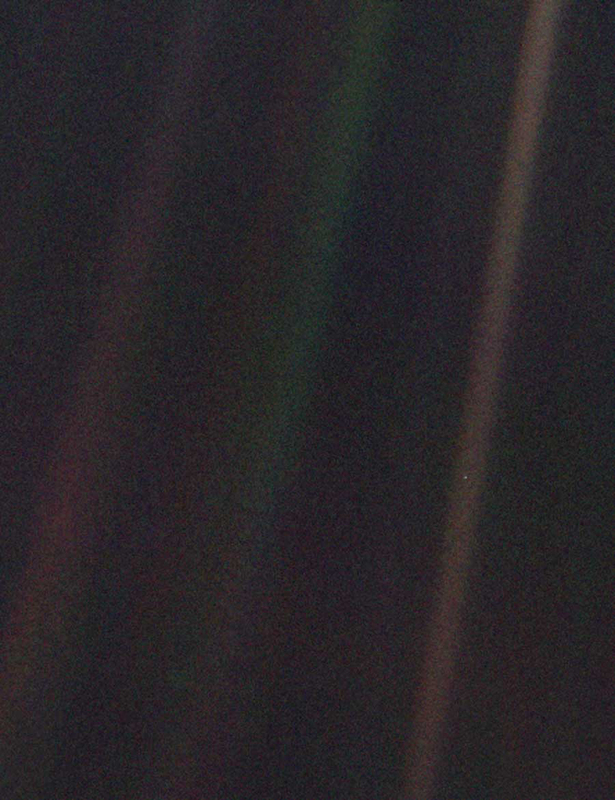 The Big Sky Astro Club in Montana has devoted a web page to the photo of the original “Pale Blue Dot” that is Earth, the image that inspired one of Carl Sagan’s great lectures and books on our place in the universe (they include some of Sagan’s thoughts on the subject as well). 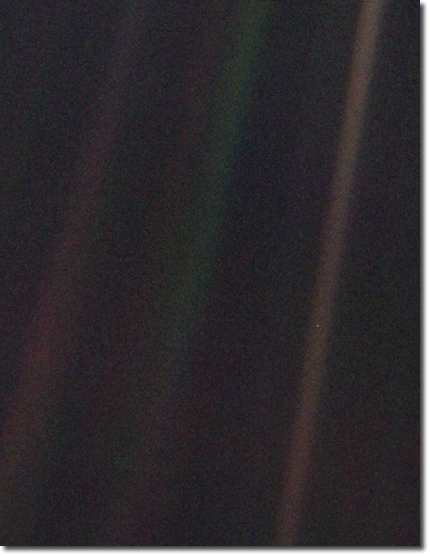 The image is a shot of the Earth from Voyager I at a distance of 4 billion miles (taken in 1990). With all of the complexity on this planet, we take up less than one pixel’s width on an old camera at an astronomically insignificant distance. It is, by all accounts, the anti-Google Earth, where the fascination is not finding your car in your driveway, but finding the Earth, knowing it’s in the view, without the help of the two lines provided on the Big Sky Astro web page (the original and a larger version are stored here on the SAS site, taken from the only untouched version I could find from the Sky Image Lab. If you can’t see Earth, get the dust off your computer screen!). This is not at all to say that the Hubble is a dead stick. Three cameras, the Near Infrared Camera and Multi-Object Spectrograph (NICMOS), the Wide Field and Planetary Camera 2 (WFPC2) (which is, actually, the one that has provided many of the images that make media headlines), and the Fine Guidance Sensors (FGS), remain functional, pending all of the equipment checks to be performed on the HST. The future of Hubble and future missions was discussed on the February 2, 2007 Science Friday with Michael Weiss, Deputy Program Manager for the Hubble Space Telescope at NASA Goddard. The podcast for this interview is available at the Science Friday site. On the subject of great astrophotography, the image below made the rounds on a number of the news services this week. What you’re seeing is a wonderful photo of Jupiter and all four moons. Callisto is at far left (roughly 1/2″ from the lower left corner), Io (closest to Jupiter) and Europa (to close right of Io), and Ganymede (far upper right of the photo) fall to the right. What makes this image so interesting is that it was taken from orbit. The orbit of Mars, to be exact, using the HiRISE camera on the Mars Reconnaissance Orbiter. The lengths we go to for clearer images! As it happens, there’s no mention of the Galilean moons on the webpage accompanying the image (it is a Mars mission, after all). Fortunately, they do provide the day of the photo (January 11, 2007). With the help of a pen (for distance measurements) and the “Jupiter’s Moons” calculator available on the Sky & Telescope sight, I’ve decided that the photo must have been taken at approximately 22:05 UT (If you try this at home, note that the photo is rotated a few degrees clockwise from the orientation they show in the java applet). Fashion will come and go, but F=ma is forever. In a world involved in a heated debate over global warming and pollution, it is important at times to recognize the significant contributions of individuals who have had profound impacts on our use of planetary resources. Today, I write in high regard of John Napier, the architect of the logarithm. To ignore the complexities of nearly 400 years of mathematics, a logratihmic scale is one in which each power of 10 takes up the same amount of vertical space. So, the distance between 0 and 1 on a vertical axis would be the same as the distance between 1 and 10, 10 and 100, etc. To the astronomer, such an approach allows the inclusion of a BROAD range of distances on the same… piece of paper. “That’s a pretty uninformative description,” you say. Example? Of course. The link below is to one of the neatest line-drawn images I’ve seen in astronomy, showing the distance of things in the universe to the center of the Earth. On a logarithmic plot, the total height of the image is just under 3 meters. Taking the 0 to 1 separation on the right hand side to be the standard unit in the universe (12 cm), the total distance in the 3 meter image represents, on the logarithmic scale, 12×1020 cm. That’s 12 with 20 zero’s after it, or 12×1021 millimeters, 12×1018 meters, 12 x 1015 kilometers, you get the idea. If you were to plot this image on a standard axis and fold it using the Earth and the Moon (285,000 kilometers) as the ends, you would have to back-and-forth the piece of paper 15,584,415,584 TIMES before you were through. And remember, the 12 cm represents the distance from the center of the Earth to the surface, which is actually 637,810,000 centimeters. The logarithmic scale. That’s what I call a tree saver! I think that’s enough mental hopscotch for now (that was far more complicated than it needed to be, but this is supposed to be as much for education as it is for astronomical entertainment). Up next, the Night Sky Network introduction promised in the previous update, the Celestia program, and the beginning of a long digression into astronomy podcasts!